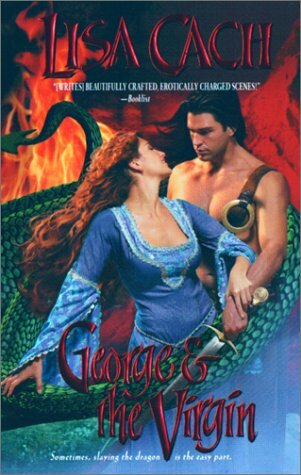 This review of George and the Virgin by Lisa Cach was first published at The Romance Reader in 2002. I rated it 4-Hearts (B rating) with an MPAA content rating of "R."
Being a librarian, I’m a firm believer in intellectual freedom and the first amendment - but honestly, even I think any book with the word virgin in the title has to go. 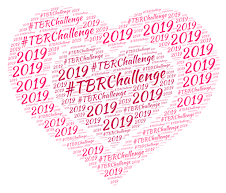 I’m not sure if it’s been just my luck lately, or if the romance publishing industry is out to get me, but I’ve read more books with moronic titles in the last couple of weeks than I have in the last couple of years. 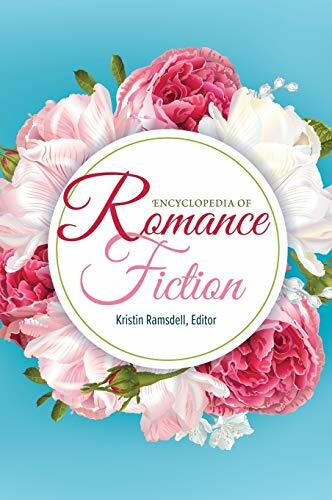 I can’t help but feel that more than few readers will avert their eyes and walk hurriedly from the romance section of their favorite bookstore upon seeing Lisa Cach’s latest. A shame really, since it’s a delightfully fun read - and probably the most unique book to cross my path in some time. Alizon is a desperate young girl living in medieval Markesew on the southwest coast of England. What could a 14-year-old possibly be desperate about? Why her virginity of course! Alizon has no wish for a husband - she just wants to be rid of her maidenhead before the next lottery. Only virginal women need apply, and instead of coin or jewels, the winner is fed to the town’s resident dragon. Alizon, having failed to succeed in deflowering herself, is chosen to be the next sacrifice. George is a professional wrestler living in the present day, who is also having a bit of a crisis. Two young boys in Missouri decided to emulate his trademark moves and got themselves seriously hurt. Now concerned mothers are out for his blood. His sister, Athena, a New Age practitioner, convinces George to let her hypnotize him. The theory is that while in the state of hypnosis he will find a way around his current doubts. Instead, George wakes up on Markesew and quickly learns he is to slay the dragon. Thinking he is hypnotized, George figures that “slaying the dragon” is symbolic of his current professional crisis. However, once he makes his way up to Devil’s Mount, he finds a surly gatekeeper, a mysterious crone, and the ghosts of dead virgins standing in his way. The old crone happens to be a poorly disguised Alizon. She escaped the dragon’s clutches 12 years earlier, and is now exacting her revenge on the townspeople who tossed her aside. In the process, she takes in each new, sacrificed girl, teaches her the art of tapestry making, and continues to build the wall around her heart even higher. She’s none too happy to see “St. George,” who not only threatens the life she has built up on Devil’s Mount, but her heart as well. What makes Cach’s latest a gem is George. How can one not love a hero who is macho and manly, but also reads Goodnight Moon to his 5-year-old niece? He talks like a guy, acts like a guy, but had enough of a feminine side to make this reader’s heart skip a beat. It is also terribly amusing as he walks around Devil’s Mount trying to find symbolic meaning in all that is happening to him. It took me considerably longer to warm up to Alizon - even though I felt she had good reason for being the way she was. She scorns the townspeople for their cowardice - for sending helpless young girls to their death instead of finding a way to be rid of the dragon. She is angry, bitter, and just plain disgusted. It takes her some time to work through this - and she doesn’t exactly aid George in his quest to kill Belch the dragon. Instead, she thwarts his efforts, and stalls him at every turn. For his part, George is not only patient with her, but there’s a wonderful dialogue towards the end when he makes her see the error of her ways. While I found Alizon frustrating at times, I’m recommending Cach’s latest on the strength of the unique storyline and the hero. Readers who are tired of picking up the same European historicals, Westerns, or category romances featuring amnesiac cowboy sheik babies will likely find George and the Virgin to be a refreshing departure from the norm. Wendy Looks Back: I am so glad I had read The Mermaid of Penperro before this book arrived in a review shipment. I remember audibly groaning when I saw the title. Seriously, I'm going to have to haul a book out in public, to my office to read on my lunch break, with THIS title?!?!?!? What a pleasant surprise it turned out to be! And the start of me learning to overlook moronic titles. The title? What about the cover, Wendy? LOL! I loved this book. I was reading it in the airport and laughing so loud someone came up to ask what I was reading. I think she was confused and disappointed. :-) still a great book. The ebook has been retitled, if that helps convince anyone. :-) I didn't love this one, but did think it very fun. Cleo: It was a fun read. Cach has a way of blending humor into her stories without smacking you over the head with slapstick.